While winter is a spectacular time of the year for most people, it is far from appealing to most pests – especially mice. As humans, we have a vast array of shelter options available to us to protect us from the bitter cold, harsh winds, chilling ice, and freezing snow; however, mice have far fewer options. These pests have to take measures that will allow them to survive during the most challenging period of the year. The most common measure – and the ultimate secret survival technique – used by mice is to seek shelter indoors. It does not matter if it is a business, a home, a garage, a shed, or a playhouse for a child – if it provides protection from the elements, mice will attempt to enter and make a winter home within it. Mice are considered to be immensely crafty and highly versatile creatures. While highly unbelievable, the truth is that mice have the capability of squeezing through a hole as small as the eraser on a standard pencil. mice can squeeze in the tightest of places. 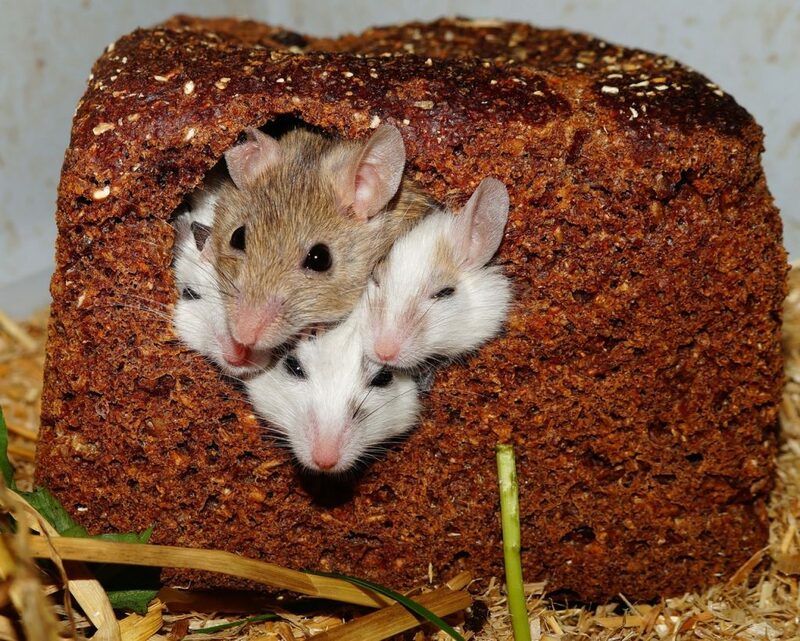 Here are 4 nestled in a small loaf of break. Rats – a rodent similar to mice – may successfully fit through a hole the size of a quarter. There are many cracks and crevices within structures that many do not even realize exist. These may lie in the foundation of the structure, the crawl space region, and even spaces between the foundation and walls of a structure. In addition to entering in structures in these small openings, rodents also have the unique ability to enter structures through drain pipes and sewer lines. Their craftiness and high level of versatility is truly the manner in which they survive during the winter months. During the winter months, it is not at all unusual to observe mice within structures; however, in most instances, only the signs of an infestation will be present. These signs include visible droppings, grease-filled tracks where the rodents have walked, squeaks in the structure, and other unusual sounds. Structures provide warmth, shelter, and – in many instances – food to rodents. If you feel as if you have an issue with mice or any other type of rodent, it is imperative to seek assistance immediately. Here at All Pest Exterminating, we can quickly determine if you have an infestation of mice and eliminate the problem. For more information on winterization for mice, signs of winter infestation, or information pertaining to rodents, simply call us today.